Obituary – Faw Faw, Billy Don « Perry High School Alumni Association, Inc.
﻿Funeral will be at 10 a.m. Monday at the Otoe Baptist church at Red Rock for Billy Don Faw Faw, 52, Enid, formerly of the Perry community. Rev. Duane Pratt and Rev. Rick T. Milam will officiate. Burial will be in the Otoe-Missouria cemetery at Red Rock under direction of Henninger-Allen Funeral home of Enid. Faw Faw died Thursday, July 14, 1994, at St. Mary’s hospital at Enid following a year’s illness. He was born Oct. 1, 1941, at Pawnee, the son of Louis and Edna (Dupee) Faw Faw. He attended Perry high school where he was involved in sports. 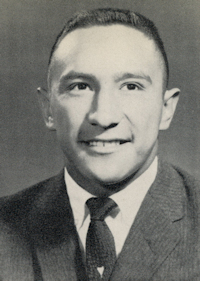 Faw Faw was a 1959 state wrestling champion. He attended Lamar Junior college at Lamar, CO. He had worked as a drug and alcohol counselor for the Otoe-Missouria Tribe and been director of the Green-Haven Halfway House in Enid. Faw Faw had worked as an attendant at the hospital at Fort Supply and was director for the summer youth program for the Otoe-Missouria Tribe at Red Rock until ill health forced his retirement. He and the former Deanne Griffin were married on Oct. 11, 1990, and lived in Ponca City before moving to Enid in 1992. Faw Faw was a member of the Olivet Baptist church and served as president of the Otoe Senior Citizens Advisory Council. In addition to his wife, of the home, survivors include four sons, Marc Faw Faw, New York, NY, Michael Faw Faw, Stillwater, William Faw Faw, Lawrence, KS, and Richard Griffin, Enid; two daughters, Amy Reed, Enid, and Tamara Faw Faw Goodson, Stillwater; three sisters, Colleen Baumgart and Betty Canaday, both of Red Rock, and Velma McIntosh, Oklahoma City; and one brother, Louis Faw Faw Jr., Stillwater. Faw Faw was preceded in death by his parents, one brother and one sister.